There has been a bit of a hullabaloo over the blog that I wrote below and subsequent interview I gave to the Observer. For much of the past year I have been castigated for being anti shooting and the ultimate insult for some was me being seen alongside the Chief Executive of the League Against Cruel Sports at the December Rally for Nature. So, it was rather bemusing to see another headline writer misunderstand our position and the inevitable uproar on social media. I think I shall continue to disappoint everyone and say that we are neither anti nor pro shooting. We are neutral on the ethics of shooting. And, guess what, we have been for over a hundred years. As I wrote in the original blog and on many previous occasions, we will continue to condemn bad practice associated with shooting such as burning on peatland to increase the shootable surplus of red grouse. Moreover, when this is illegal (such as the killing of birds of prey) we will work with the police to catch the criminals. I am proud of the track record of our investigations team - no other organisation has done more than the RSPB to try to stamp out illegal killing and this effort continues. But, there are people who are doing some good things and what I was trying to do was give praise where it is due. 60% of UK species for which we have data is in decline. Nature needs all the friends it can get especially those who invest in managing their land in a sensitive and thoughtful way. And we will continue to work with those that try to do good. We have a rich and diverse charity sector which includes those that champion animal welfare causes and those like the RSPB whose charitable objectives focus on conservation. Both causes take action for public good and the distinct approaches should be respected. And, one final thought. Today's little storm has, if anything, reinforced the point I was trying to make - a simplistic interpretation of our position is not only wrong but unhelpfully divisive. If you are a regular reader of certain shooting or farming magazines, you’d be forgiven for thinking that the RSPB had a fraught working relationship with the whole landowning community. The reality is very different. We have developed excellent relationships with many farmers and landowners over the years. We have done this because much of the UK's wildlife depends on farmland and we work with thousands of farmers to find and share practical wildlife-friendly farming techniques. These relationships are important to us and have resulted in some amazing conservation stories, such as the recovery of the cirl bunting and, as James Robinson described in his guest blog last week, the stone curlew. The future of these two species relies almost entirely on the sympathetic management of their habitats by farmers. Many lowland farmers also manage their land for pheasant and partridge shooting. The RSPB is neutral on the ethics of shooting wild or released birds yet we are often misrepresented in the shooting press as anti-shooting. This is wrong, unhelpful and unnecessarily imposes a strain on our relationships with some in the farming community. Yes, we condemn wildlife crime including any persecution of protected birds of prey. And yes, we continue to work with the police to end illegal killing which remains prevalent in the uplands, threatening the future of hen harrier, and still occurs on some lowland estates. But, the contribution progressive shoots can make to supporting threatened wildlife is significant, and we are delighted to help them further. This isn’t a contradiction. We simply do whatever nature needs and will work with anyone that wants to help wildlife. Plenty of farmers with shoots provide beneficial habitat management for wildlife and we recognise and value this. In areas where good habitat management is combined with low release densities, or in areas that work to promote breeding populations of gamebirds, the impacts can be very positive. For the grey partridge, work by shoot owners through farm management is really important for the species’ long-term recovery. Game estate habitat management includes woodland sky-lighting, planting cover crops, creating conservation headlands, and more. Recent figures from the Game and Wildlife Conservation Trust (GWCT) show that shoots create or maintain 7,000 ha of hedgerows and 100,000 ha of copses (see here) . That’s a lot of land for wildlife. It is likely that game estate management, including farmland habitat management and targeted predator control can increase the numbers of some birds, for example ground- nesting species such as lapwing and grey partridge. Research shows that woodland management for pheasants can increase the numbers of some bird groups, such as warblers (see here) and estate management also benefits some small mammals, particularly wood mice and bank voles (see here). As I have written previously, however, there can be negative environmental impacts associated with high densities of gamebird release, (for example see here, and here). And it is the continued increases in the numbers of pheasants and red-legged partridges released - up to c50 million per annum - that cause us particular concern (see trends in pheasant releasing here) and some of the impacts demand further research. Organisations such as GWCT provide advice on sustainable lowland shooting to help their members, many of which are farmers too (see here) but I think much more should be done to understand and address these impacts. Our work with landowners who create wildlife-rich habitats through the work they do on their land is important for recovery of farmland wildlife. This is why we cherish our work with farmers and will continue to form new relationships with any farmer or landowner that is keen to help the wildlife we all care about. And, we will not be distracted by those wishing to cause mischief by suggesting otherwise. What do you think about the RSPB's work with farmers and shooting estates? Thanks to all of you for engaging in the debate. These are thoughtful comments unlike some I have received via twitter! We'll carry on working with folk on the ground in the way you've described and yes, we have more work to do to get the comms right - including more targeting to farmers. We are humble enough (!) to acknowledge that others do great work for nature and that landscape-scale conservation is not 'owned' by anyone. That came through loud and clear at the Bristol event last week where we shared best practice and a willingness to learn from each other. The good news is that there is a genuine desire to improve collaboration from government bodies, charities, land owners and local communities - indeed all 'our' big projects depend on these three groupings working well together. Rob Yorke - I don't know about the 'major trust issues' you refer too, as I don't encounter them, but in my experience (having worked a lot with farmers on devising Countryside Stewardship agreements etc) many farmers are only too happy to meet RSPB field workers to discuss conservation management on their farms (I'm not an RSPB field worker, by the way). On the ground, I don't think the conflict you cite is really that big an issue. OK, most farmers I meet will have a good-natured dig about 'those damned predators', but after that it's down to business - the discussion turns to what can realistically and practically be done to help wildlife on the holding. The cirl bunting recovery has been achieved by farmers taking action based on advice from RSPB farm advisers over two decades; same with stone curlews in Wessex and the Brecks. 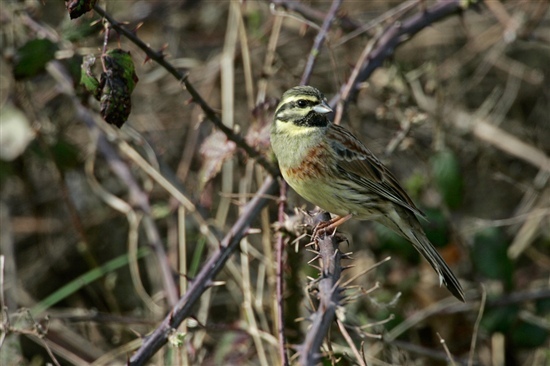 I very much doubt the cirl bunting population would have hung on and then recovered had the RSPB not invested money researching the causes of the decline, and then further money employing farm advisors to help farmers work out what to do, supported by agri-environment funds. Farmer-led groups are a great initiative too - both approaches can work. Regarding Martin's question, absolutely, work with shooting interests! Things done for game birds (such as cover crops) could be very easily tweaked to benefit wild farmland birds and, in my experience, estates are only too happy to tweak things if suggested to them. Steve H, thanks for your comment. Working with 'anyone who wants to help wildlife' is, I'm afraid, not the same as working with those who can potentially deliver it in spades - even on your 'barren fields'. As a member of the RSPB, the reference in 'Bob for Nature's' letter to me referring to 'uprooted hedgerows' and 'fields forsaken' hardly encouraged me to work with them. So perhaps don't be so proud RSPB, you don't 'own' nature or its recovery, forget slick PR, get boots on the ground with a shotgun under your arm (obviously fake, non-lethal version!) when you go meet the farmer. That might deliver 'better results' for wider biodiversity. Martin, what you write is persuasively reasonable. Unfortunately writing it here will not have much impact, as we are already a supportive audience. Rob Yorke is right when he refers to the widespread lack of trust between certain parts of the rural community and certain parts of the conservation one, and that the media's need for attention grabbing headlines can (tends to) be unhelpful. So the main issue here for me is 'how can the RSPB communicate it's position to more members of the rural community? ', which will require by-passing their traditional media. One thought is to divert a small part of what is clearly a substantial ad budget for the Big Garden Birdwatch into doing mailshots direct to farmers. A full page colour ad in the Saturday Times mag would pay for quite a few letters! I appreciate that the birdwatch is a brilliant way to engage with the public and, I presume, drive membership. But if birds find farm land to be barren (and around here it tends to be very barren) they will not be able to survive in gardens alone. One other point: if Rob Yorke had the time I would love to know how he defines 'better results', in his comment. I'm not being implicitly critical, just curious. Martin, if I had the time of 'redkite' or 'nightjar' to post, I would love, as a rural surveyor, to provide more reality feedback from the grassroots. Media can be unhelpful in reporting HQ press releases from NFU, RSPB and BASC et al rather than positive, workable solutions on the land that delivers more wildlife but which may offend some members' sensibilities. One observation: farmer-led conservation groups (cluster farms) tend to deliver better results than conservation NGO led ones (Nature Improvement Areas). There are major trust issues between conservationists and landowners that we must overcome if common ground biodiversity objectives for huge chunks of the countryside are to be achieved.